Obituary for Alfred C. Maurhoff | Fox Funeral Home, Inc.
Alfred C. Maurhoff, 100, of Cabot passed away on December 5, 2018 at the Good Samaritan Hospice. Born May 18, 1918 in Marwood, PA, he was the son of Charles Kroneberg and Odessa Maurhoff Kroneberg. Following the death of his mother, he was adopted by his aunt and uncle Nelson and Lydia Maurhoff. Alfred was a direct decendent of Emil Maurhoff, one of the original families in Saxonburg. He was 1937 Graduate of Butler High School, he then was drafted into the Army in 1942 where he served in the 324th Engineers, 99th Division where he was a radio operator. He was in the Battle of the Bulge and at Remagen. He was discharged in 1946. He attended Schrivenham University in England after the war taking part in the agricultural program. He was a life long farmer, having dairy cattle until 1956. He married Lola Fetzer Maurhoff on April 6, 1953, He became a self employed electrical contractor in 1956. He attended St. Luke Lutheran School and was a life long member of St. Luke Church where he was a Sunday School teacher and superintendent, elder and trustee. He was an agent for Hannahstown Mutual Insurance. He served on the Butler Farm Show Board of Directors and was a Jefferson Township Supervisor. Alfred and Lola loved to travel and enjoyed spending time with family. 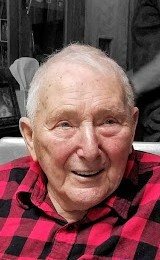 He participated in the Memorial Day parade in Washington D.C. with his fellow 99th Division veterans, up until this past year when he was 100. Surviving are his children, Emily (Todd) Davis of Beaver Falls, Herbert Maurhoff of Cabot, Charles Maurhoff of Cabot, Anita Terwilliger of Cabot, Jeanne Maurhoff of Frederick, MD and John (Julie) Maurhoff of Pacifica, CA, 6 grandchildren.Lyda (Anthony) Latagliata, Andrew (Stephanie) Davis, Carolyn Davis, Matthew Davis, Eve Terwilliger and Kelvin Maurhoff. He is preceded in death by his parents and adoptive parents, his sister, Esther Bauer and his brothers, Frank "Mike" Kroneberg, Robert Kroneberg, Dave Kroneberg and Donald Maurhoff and her son-in-law Hans Terwilliger. A memorial services will be held on Sunday, December 16, 2018, 1:30 pm at the St. Luke Lutheran Church, with Rev. Barry Keurulainen officiating. Interment will follow in St. Luke Lutheran Cemetery in Cabot. Memorial donations may be made to the St. Luke Lutheran Church Willis Follstaedt Scholarship Fund or St. Luke Lutheran School.